Don’t want a bag that digs into your shoulders while you’re riding? Instead, want a neat little bag that’s comfy while you’re zipping around town, or an easy-access receptacle for day trips? Think less camping with cagoules and more commuting with cool. 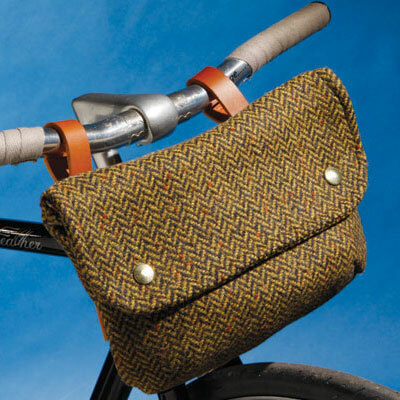 When you don’t need to carry much, on shorter journeys, and don’t want a pannier rack cluttering up or weighing down your handsome bike; when you feel like emulating the Dutch but don’t want a permanent basket on the front of your streamlined steed… You could be called fussy, but you could also be the perfect candidate for a handlebar bag: not just any handlebar bag but one that looks just as good off the bike as on, and could even pass for a non-cycling bag among your pals. 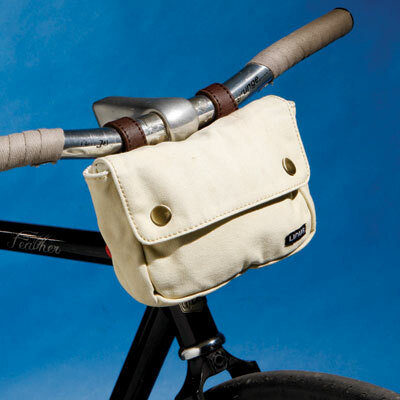 Fear not, discerning cyclist, for Cycling Active has gone forth to find the best of the handlebar bags for the sartorially conscious. Your choices are somewhat dictated by the type of bike you have. 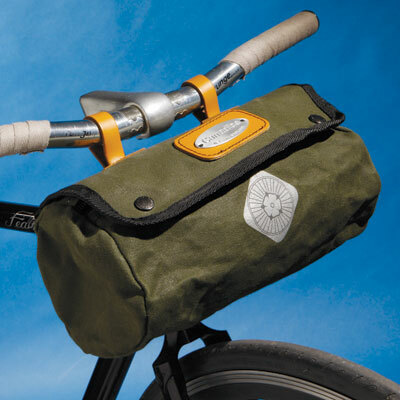 Ortlieb’s KlikFix system, for example: curved bars will require an extension and bags with little buckled straps may not fit over gear changers. Also, you may not want too much weight bearing down on gear cables. Consider whether you’ll be keeping your bike within sight on rides. If not, how secure is the bag if you leave it attached, and how easy is it to remove with chilly, tired hands? You may well be grateful for a bag that easily detaches from the bars once you reach your pit stop/shop. There is little point carrying stuff within easy reach of your hands when you can’t access it while riding. 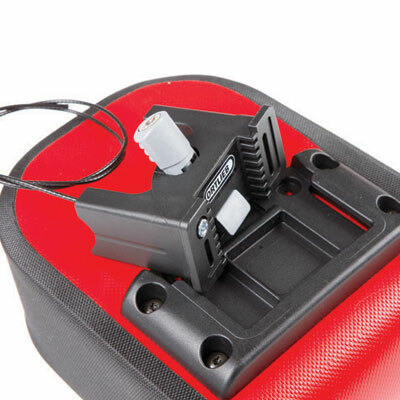 Ideally, handlebar bags should be operable with one hand and their contents visible from the riding position once opened. 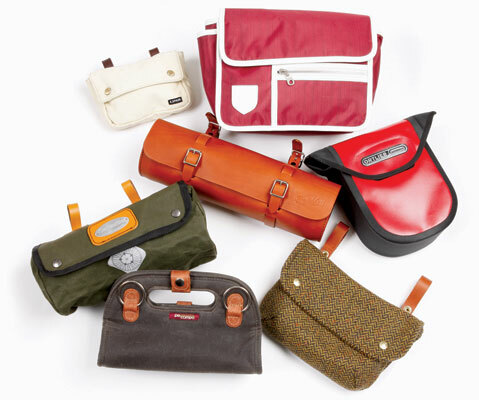 Handmade in London, this attractive, sturdy little bag has oodles of vintage appeal. A shoulder bag or clutch off the bike, thanks to interchangeable leather straps of different lengths which all joing together. Substantial poppers keep the contents of the bag safe while the inside, with its colourful lining, has space for purse, phone and a few day essentials. An über-stylish, all-leather, serious piece of British craftsmanship for toting tipples. 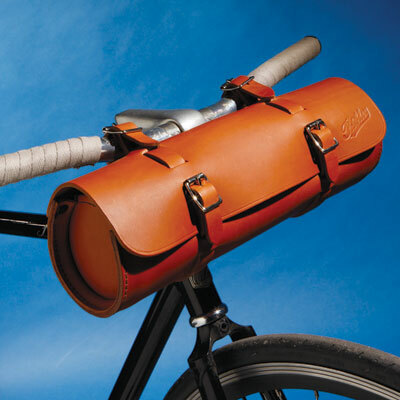 It carries a premium price-tag but you get an item of beauty to bedeck your bicycle. 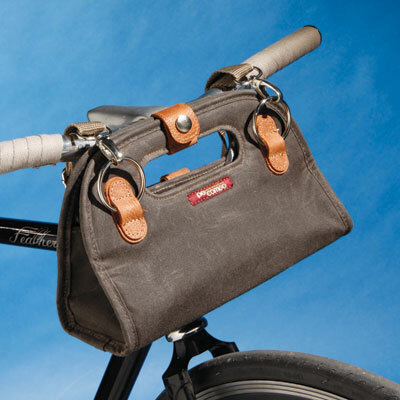 Three smooth buckled leather straps affix the bag on to handlebars (minimalist steel-framed and wide handlebars only) and stem, with two further buckles to the main compartment. Not easy to open or reach inside while riding, and it’s not an item you’d leave unattended in town. Also a faff to unbuckle, this is an adornment of form. Dimensions: L36cm x D10cm. With its adjustable handlebar straps, the Streeterville straddles comfortably even the most gear changer and cable-crowded of handlebars, sitting upright for easy on-the-move access to snacks, lippy or gloves, while mobiles get a neat exterior pocket with magnetic closure. Likewise, the main compartment pops closed to fend off showers (not deluges) while a shoulder strap makes for easy off-the-bike carrying. With an inside pocket and sturdy workmanship, it comes in umber (pictured), fanfare and feathers/sky stripes. Dimensions: W25 x H16.5 x D9cm. Versatile, functional and attractive, this neat, boxy little bag was designed by a London-based start-up and made in China by laptop bag manufacturers. Padded pocket spaces abound for tablet, phone, wallets and umbrellas around a large interior space. 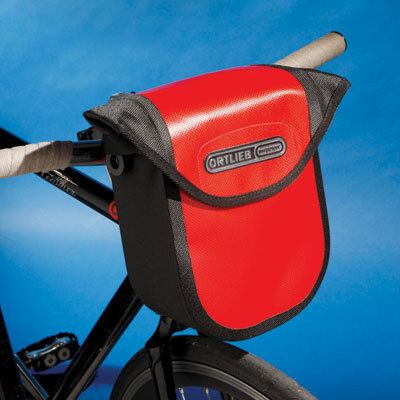 Covered with water-resistant nylon, flexible webbing straps also handily attach to pannier racks, though white trim and straps may show the dirt. Doubles as a satchel off the bike. Comes in forest green, rust, liver and maroon (pictured). Dimensions: W26 x H19 x D13 cm. With its hard-wearing, unisex vintage appeal, the Zipped Roll is eminently sturdy with its 100 per cent waterproof cotton duck and chromed leather. 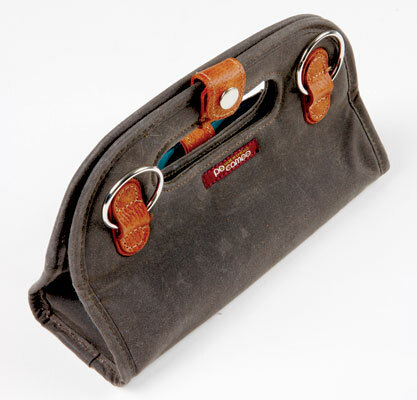 The lack of carrying handle, and straps fastened inside the bag by fiendishly fiddly buckles mean, like similar bar bags, its place is on the bike. Fits neatly on uncluttered handlebars only, while gaining access via flap and zip en-route may take practice. 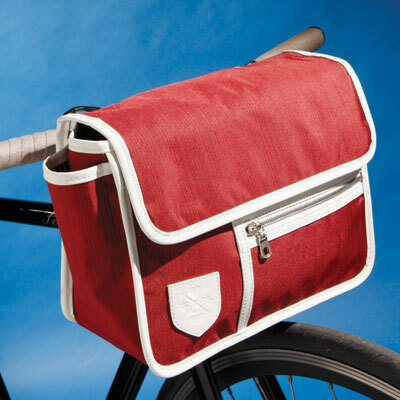 Nominally a saddlebag, longer straps for handlebars (20cm-plus) are available from Carradice from £5. Dimensions: D14cm x W30cm. The Ultimate 5 is pictured: it’s spray-proof with a neat, functional design, and a shoulder strap for comfy off-bike toting. With fewer options for affixing maps (great if you prefer GPS/phone maps, or know your way) than its big Ortlieb brothers, there is still enough room for the essentials. Fixes to the bike via Ortlieb’s KlikFix-compatible locking mounting system, which requires assembly. Available in graphite, orange, red, black and white. Dimensions: H20cm x D8cm x W14cm. For all-round looks, quality and functionality, the Po Campo is a great little number. Pockets aplenty, and straps fitting on most if not all handlebars, with easy access while riding, this attractive bag promises long service with its durable outer materials, metal fasteners and leather straps. However, don’t take it out in a deluge, as the top is open, as too is the phone pocket on the front. Although the Po Campo is at the pricier end of the scale, you get what you pay for here.